The Mass for the Dead is celebrated on November 2 at the Municipal Cemetery "Our Lady of Carmen" of Totana, from 5:00 pm, according to sources from the Department of City Services. 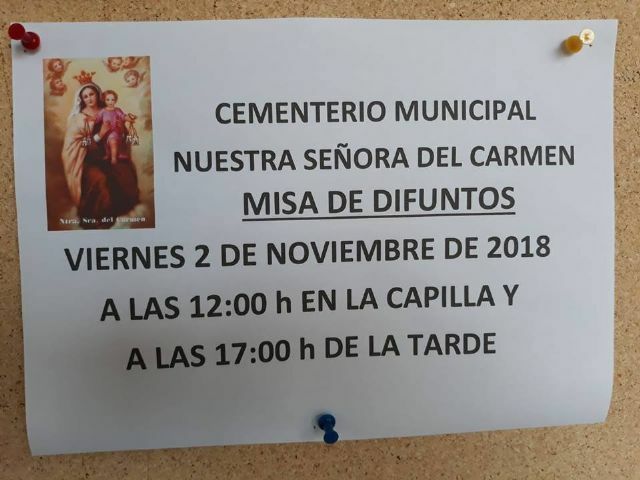 In addition, the Department recalls that companies that are carrying out works inside the Municipal Cemetery "Our Lady of Carmen", since yesterday can not perform such actions in order that the site is in proper conditions of cleanliness and decoration of face these days of the festival of All Saints. Once celebrated the day of Las Animas, on November 2, the works that have been pending or are going to be executed can be restarted, according to the mayor of the branch, Víctor Balsas.